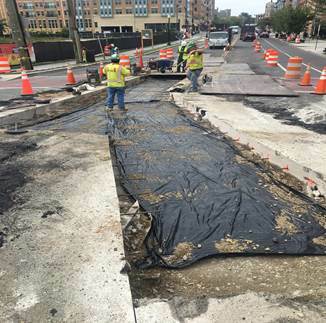 Contractor FMCC worked at the west side of the intersection of 8th Street NE and Monroe Street, placed geotextile fabric, reinforcement and tie bars and poured 10” concrete for utility cut repair. 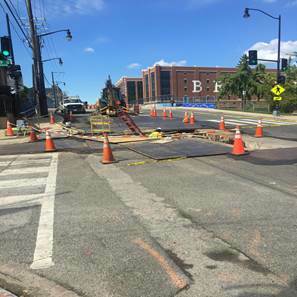 Contractor worked at the intersection of 9th Street NE and Monroe Street NE, backfilling around the east vault manhole with GAB and placed temporary 12.5mm asphalt to restore the roadway. 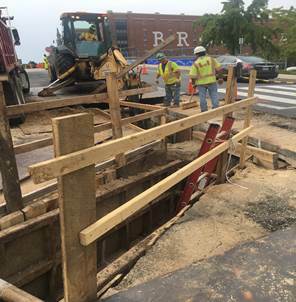 Contractor worked at the intersection of 9th Street NE and Monroe Street NE, excavating /trenching for 6-way fiberglass conduits. 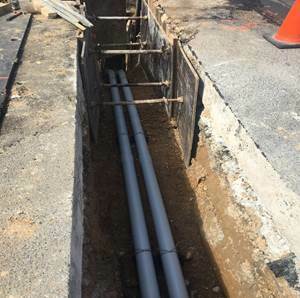 Contractor worked east of the intersection of 9th Street NE and Monroe Street NE, excavating and installing 2-way 4” PVC pipes. Contractor continued trenching and laying 2-way 4” PVC pipes east of the intersection of 9th Street NE and Monroe Street NE. Contractor removed steel plates at the intersection of Monroe Street and 8th Street and placed 2” of temporary asphalt for utility cuts. Contractor continued trenching for fiberglass conduits west of the intersection of 8th Street NE and Monroe Street NE. 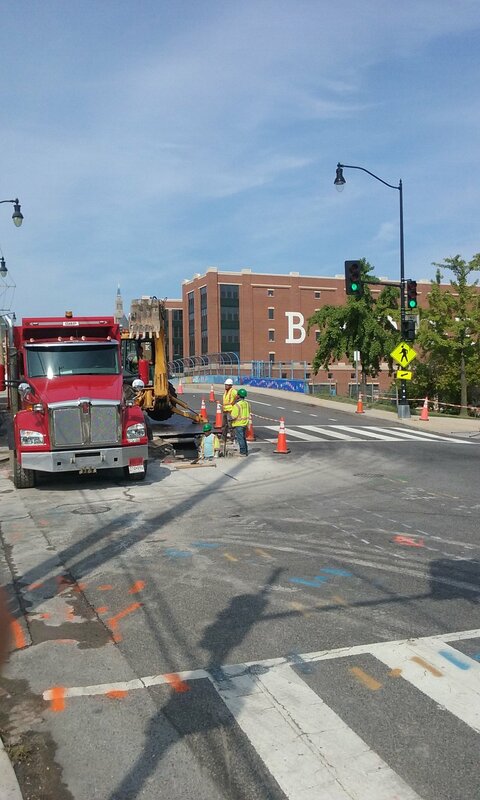 At east side: Intersection of 9th Street NE and Monroe Street NE, the contractor continued clean up. Contractor continued trenching for fiberglass conduits from the west vault manhole towards the split. 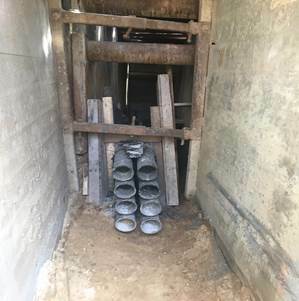 At east side: Intersection of 9th Street NE and Monroe Street NE, the contractor continued excavation for 12-way fiberglass conduits from the vault manhole to the split. Contractor continued trenching for fiberglass conduits from the west vault manhole towards the split; and laid and encased fiberglass. At east side: Contractor poured concrete to encase 5”, 12-way fiberglass conduits. Contractor backfilled trench cut for 12-way 5” fiberglass conduits at the intersection of 8th Street NE and Monroe Street NE, placed GAB and Geotextile fabric. Tie bars were drilled and bottom rebar placed. 10” PCC poured for roadway base restoration. Labor Day – No construction activities.